I know that this is a statement that is frowned upon because most people like to think that we are in the sharing or referring business but when its all said in done we exchange good, services or products for dollars which means SALES. Now to get to the final sales process as Marketer you must always be creating a sense of urgency either vocally or with copywriting. Both excitement and posture must be strategically executed as to pull the prospect in. Too little or too much of both will just turn them off. As you move the sales process along you must have full control of the situation at all times. Setting a tone with confidence will benefit you when asking for the business. 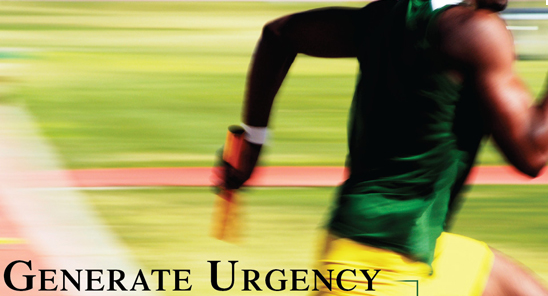 Here are 3 ways to creating a sense of urgency that moves your prospects butts into action. No one likes pain but often pain is a major motivator. So many people get frustrated in their situations of living in consistent pain either emotionally or physically and look to you to solve that pain. Chances are that’s why you were able to book an appointment or how they came across your information online. But even when your prospect expresses that they are in pain and you show them a solution your prospect may still hesitate on taking action. That’s when you must highlight their pain in creating a sense of urgency. For example if you sell a product that can help a new mother lose weight quickly but she says she needs to sleep on it here is great response. Well Mrs. Mommy Prospect with Summer around the corner you’re going to want to get in the best shape so you can have enough energy to play around with your little one. Because all of our products are natural you will see results in two weeks and be bikini body ready by summer. What is Mrs. Mommy Prospect going to do? She’s going to weigh the fact that she has a few pounds to lose and wants to look great in her two piece bathing suit while having enough energy to play with her child. Creating a sense of urgency by throwing back in her face what’s painful for her makes her naturally want to do what it takes to resolve that discomfort and that happens to be your product. Creating a sense of urgency can be seen by some of the largest Retailer. They offer huge discounts for a limited time period like 1 day or 3 day weekend sales. Black Friday is a great example that deadlines move people into action. When you see sales promotions with attention grabbing phrases like limited time offer, bonuses available now, and buy one get one free, chances are you are more compelled to buy because you don’t want to miss out on a deal. The same goes for your prospect. Lets go back to Mrs. Mommy Prospect. You can add a sense of urgency while you close her. Mrs. Mommy Prospect all we need to do to get your bottles in your hands in 4 days is to call customer service to place the order and if you order today I can secure free shipping for you. You just sweetened the pot by adding more incentives which makes Mrs. Mommy Prospect want your product even more. One of the great ways to secure a close with your prospect is to share a story with them. This could be a personal story or a testimonial. Testimonials are powerful when used correctly. Testimonials pull on the heart strings. The key is to share a testimonial that is closely relatable to your prospects objections or concerns. This makes creating a sense of urgency natural. So back to Mrs. Mommy Prospect if she’s still not 100% that she should move forward then sharing a story may help her become clearer. Saying something like this typically works best: Mrs. Mommy Prospect let me tell you about a young women that was a new mommy like yourself and she had gained 30 lbs. After trying all the fad diets she gained 10 more lbs. Finally, she decided to find a natural way to lose the weight and found our products. She was not only able to lose all the weight in 2 months but she loved having the energy she needed to play with her child. She reported that her new found confidence is priceless. Mrs. Mommy Prospect can relate to this women because she’s tried everything to lose weight and still feels and looks a like a lump on a log. At this point Mrs. Mommy Prospect is saying to herself if she can do it so can I which means she is closing herself. Weather in print or verbal creating a sense of urgency all boils down to delivering a message that makes your prospect take act now. The more they think about it the more they have time to talk themselves out of making a deal with you. During the sales process prospects need to guided on what’s important and it’s your responsibility as a Marketer to guide them through this process. Even if your prospect is hanging on the fence with both arms using these 3 ways to creating a sense of urgency will move their butts in to action. Still looking to build your Network Marketing Home Business the RIGHT WAY! Click the Link NOW to Join A Community of Elite Marketers Using the Best Online and Offline Strategies To Help You Build Your Home Business Empire FAST!